MERG has been succesfully developing and using the CAN network for modelrailroad. 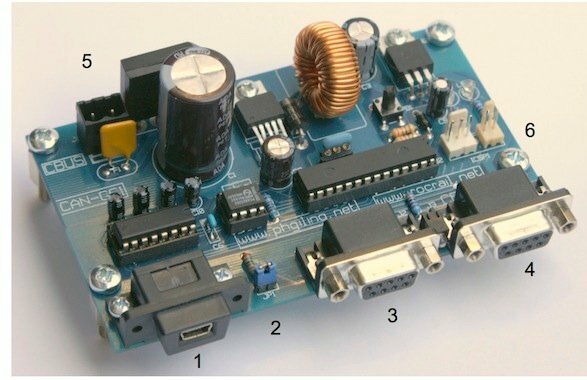 The basic idea to follow the trend in GCA (MGV) boards and to have this CAN network adaptable for all available interfaces, like GCA93, GCA136, GCA76 and many others. The standard MERG units are all made ( so far ) for 8 bytes only, and also different tasks like input, current detection, turnout coils, etc, need different units to connect them . Most mergCBUS units in this line will have 16 bits on board, and each of these bits ( = ports) is programmable for any task you want. Rocrail supports this way of programming with extending possibilities, making the whole process of configuration exactly the way it should: user friendly ! A professional produced board with through metallisation, soldermask on both sides and clear print is available now. Connectors also have 12Volt to feed all connecting nodes. The basic idea is to use this type of board for modules setup, which are frequently disconnected and transported. These modules can be placed together in different order. MergCBUS is ideal for that! The users I have to deal with, like a better connector, instead of fastening wires in screw-terminals. Therefore I use the easy to assemble and rigid D-connectors. MergCBUS connectors only have to supply mergCBUS system itself, so Subd9 connectors are very well suitable. All CAN-gcx boards have on-board jumper to connect 120 Ohm to the mergCBUS, of which one should be at each end of the Bus. Please consider, that it is not allowed to connect- or disconnect the mergCBUS , while in function. This is a general recommandation for CAN. A more 'value for money' solution is to mount standard D-Sub connector and use an USB-RS232 conversion cable. A USB converter is highly recommended. Boards, programmed processors and complete kits are available from www.phgiling.net. With a proper tool, it is possible to do the programming of the chip yourself. The programmer , used for these chips is called PICKIT 3 from Microchip. The on-board ICSP connector is useable for this programmer. ICSP connector on-board is made conform specification of MERG. For connection to PICKIT3, the cable cannot be 1 to 1. See PICKADAP4 how this is done. Sub-Library Serial Do not select USB type for the FTDI-USB connector! Le1 Bus activity It is not timed and thus only visible at high CBUS traffic. Le3 Not used; Leave unmounted. For future firmware versions. PB1 Not used; Leave unmounted. For future firmware versions. On J1 a power supply of 12-20 V AC OR 16-24VDC can be connected. USB or RS232 Sub-D 9 connection. In case of USB: Make sure the plug is completely in the socket; It needs a little force the first time. The reason for using D-type connectors has been explained before. Electrically , there is no difference between mergCBUS (12V) and CAN-GC . The following conversion tabel explains how both can be interconnected. Only four wires are needed. Use the standard wiring as advised in MERG documentation, i.e. twisted wires for the CAN.